HUGE VICTORY: HHS Affirms ALL Vaccines are Illegal! Sometimes you win by voluntarily dismissing your case. That’s what happened a few weeks ago when the Informed Consent Action Network voluntarily dismissed its Freedom of Information Act (FOIA) case against the Secretary of Health and Human Services (HHS). 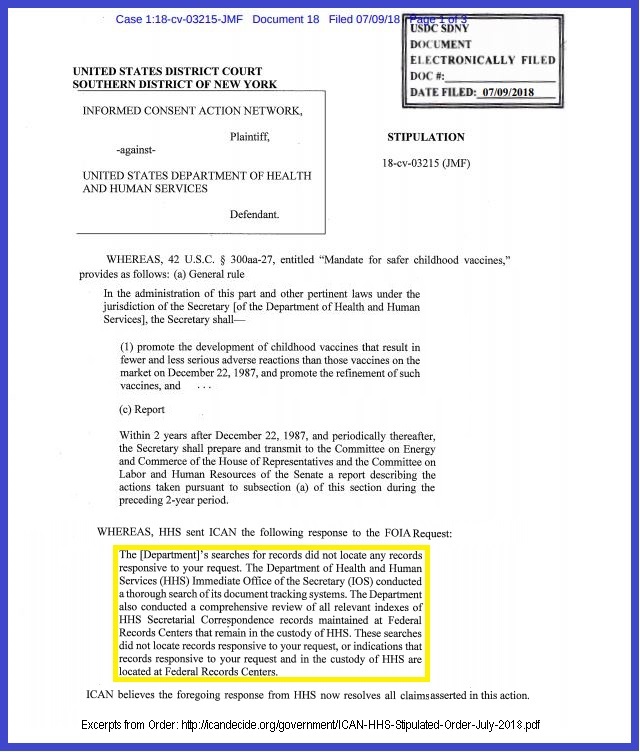 Earlier this year the Network sought copies of the Reports that the infamous 1986 Vaccine (sic) Safety Law required the Secretary to provide to Congress every two years. Let’s remember where that all started. In 1976 we had the First Swine Flu Pandemic Vaccine. Over 400 people died from the vaccine and the drug companies had to withdraw the vaccine, subsequently, there was no flu pandemic. The lawsuits started. Then the companies told Congress they would withdraw from the vaccine business unless Congress “protected” them. It did. The 1986 law, which unconstitutionally took away from us our First Amendment Right to Redress of Grievances regarding vaccine injuries, also commanded the Secretary to make sure vaccines got safer, and to report to Congress about that every other year. As we’ve known for some time, that never happened. Vaccines got much, much more dangerous — “unavoidable unsafe” as our Courts have said, and the Secretary never told anything to Congress. The smoking gun of vaccine lies! What can you do about the Secretary’s failure to obey the Law and make sure vaccines are safer? What can you do to protect yourself and your family? You must assert your right of Informed Consent. You can, and must, refuse all vaccines!